Stuck in the tutorial (even though I've played the game before, I haven't be in it in months, and numerous updates, so I figured a tutorial was in order). Obtain a Fuel Thruster > Smelt the Laterite to Aluminum I plugged in the smelter, but in a different port from the one the tutorial was insisting (I didn't see the prompt). It was running, so I put the laterite on it, and it started smelting. Kept saying "plug it in" I unplugged it, moved it over, and plugged it into the indicated connector, it resumed smelting. Prompt said to add laterite when there was already some on it. Tried removing all of them (letting one piece finish smelting then removing the aluminum) then adding laterite to an empty smelter. It is now stuck on that step and it won't let me proceed past it. Basic forum etiquette: No zombie threads. If it's a subject you'd like to discuss in a current context, then mention the original thread and start a new one. As has already been pointed out, information turns over quickly, especially for a game that is updating frequently like this one is. If the thread is really old, then anything in it will be very outdated. Even if the subjects are related, the questions and concerns will change drastically over time (a key example here would be vehicle controls). Don't type all caps. Don't feed the trolls. Don't tug on Superman's cape. Don't spit into the wind. Don't resurrect dead threads. Welcome to the internet. 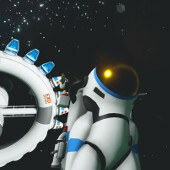 I guess one silver lining there is that Astroneer is becoming recognizable enough to have copycats and spoofs. Not good to have them, but good to have the recognition. When people start copying you, that's when you know you're doing something right. Still, that app needs to be taken down. I love Large Platform D so far. The only change I would make to it would be turn the Medium Storage 90 degrees when they're on it (so you see them from the side and it's all visible). Otherwise it's perfect for storage, especially for Research, right next to research stations. Large Platform D makes a great "extra large storage" since you can fit 10 medium storage on it, and organize in a way that everything is visible. Maybe they have plans for the big storage dome. Or maybe it's designed to be mobile storage? I haven't printed one yet, so I don't know how big it really is compared to the new rovers. I like the idea of having an underlying story, but one that the player doesn't have to follow if they choose. There would need to be some part of it that drives exploration, and some parts of it that can only be advanced by traveling to the other planets. I kind of have a story in mind (I think we all do) but really I'm just hoping that it eventually gets something. It could be similar to Slime Rancher in the idea that you can reach the "end" of the story at your own pace- quickly or slowly or never- but then keep on playing for as long as you want afterwards. Overall, I'm loving this update. good: I love the new modular base design. Choosing the exact placement and orientation of each platform is awesome. The larger habitat looks neat, and I guess might hint at possible interiors eventually? The larger flattened area makes it a lot easier to level out even more space for expanding the base. The movable platforms make life much nicer. Now we can place 4 wind turbines on a large platform, and just move it around to catch the wind. I only played with the Extenders a little bit today, but so far so good. (Except for the pack falling right through the ground right next to my habitat when I tried to store it there.) neutral: Noticed that the large platforms can connect to tethers and provide O2, but the small platforms don't. Interesting, and I guess it makes sense. Adds to the challenge of base design. Now the small generator can auto-feed itself from nearby resources once you feed one in. Convenient at night, not so much when there are other, better power sources working and I want it turn off. bad: Still waiting for the rover controls to be overhauled. They still stink on ice. Yuck. I don't like the removal of front and back mounts from the large rover. How about giving us an adapter attachment instead? Tethers connect to EVERY large platform within range. It's like a laser light show in here. Kind of expect others to mention: With the ability to place the vehicle bay on uneven ground, eventually somebody's going to have a bad time with their shuttle. You still use the habitat for this? 1. Print your large shuttle 2. print the enclosed seat on top 3. grab the enclosed seat and place it to the side 4. print 2 large storage on your shuttle 5. place the enclosed seat back on it, on one of the large storage Basically, all they did there was fix an unwanted exploit, and the only real downside to it is now we have to unlock the enclosed seat, which is how it should have been before. You know, I've been spending a lot of time over the past month playing other games (mostly Early Access; love me some Early Access) and just the other day I started wondering to myself "what will SES do next to pull me back into playing Astroneer?" This will do it. Good thing I have a 3-day weekend ahead of me. Sure are a lot of armchair quarterbacks on this board. What is the use of space exploration? You're not getting off the planet without an enclosed seat of some kind. You'll either need the enclosed 1-seat, or the habitat (which would require the printer). To be fair, why would they pay a lot of attention to a discussion board where so many of the people don't understand THE GAME IS STILL IN ALPHA? (They do pay attention though, by the way. Quite a few of the changes have been things suggested or requested here.) The current method is an enormous improvement over the old random system. And it has a long way to go in development, just like the rest of the game. A couple things I'd like to see at some point: 1. Nerf the research on the resources. Maybe the first nugget gives full points, but every one after that is less. If you already researched Laterite, what would you really gain by doing it again? 2. Add some type of "scanner" (maybe something you have to unlock) that can do a scan of a crash site and feed that data in as research points. It could be a small, single-use item. Print it on the backpack. Plug it into the wreckage to get the points, and then it doesn't detach so the same wreck can't just be farmed for points repeatedly. The real trick is hitting the number before the save's frame rate hits single digits. I'm game to try, though. I've seen this as well. For me it happens when I exit and reload the game later.